If this were an episode of “E! Fashion Police,” the Air Force would have (more than likely) been on the “worst dressed” list. Flashback: Air Force played Navy over the weekend, with the Midshipmen winning 28-21 in overtime against the Falcons. But what also caused a stir were the new uniforms Air Force was sporting: Specially designed uniforms, inspired by the Air Force’s B-2 Spirit and F-22 Raptor aircraft. The name on the back of the even-numbered jerseys had “F-22 Raptor” while the odd numbered jerseys had “B-2 Spirit” in place of the names. The helmet logo represented the top view of a B-2 Spirit aircraft. @am_myers: WOW. 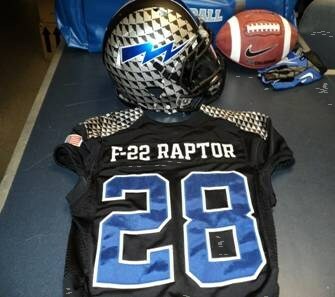 Air Force black uniforms for today’s game vs. Navy are freaking HIDEOUS! Who approved THAT??? Good or bad, fashionable or not, any makeover always takes some time getting used to.